Friends in Chicago tell me that Studs is soon to pass. Sing a spiritual. He would. Studs is now 96. 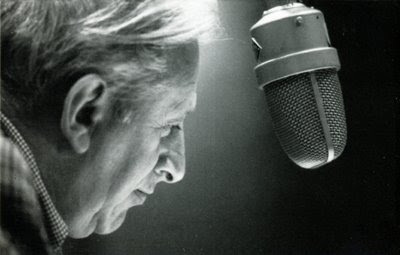 As a Chicagoan I grew up with Studs Terkel on the radio. He taught me about the voices of the world, and to listen to everybody, because everybody’s got a story, and everybody here is a part of this American experiment, and those elsewhere have much to teach us. He showed me that war is crazy and music is life and voices are musical and when music and voices are paired, it’s magic. His daily one hour interview show introduced me to Mahalia Jackson and Maria Callas, Big Bill Broonzy and Bob Dylan, Bertrand Russell and Nelson Algren; plus countless actors and authors and civil rights leaders and those were the times. Most importantly he taught me to care, with all my being, and to show it. I never saw Studs without a book, almost always several. He lambastes the cultural amnesia in America. He can remember conversations he’s had decades earlier, or plays he’s seen, or concerts he’s heard. And his stories of them bring the long gone performance back to life as Studs infuses it again with his energy. Author of Hard Times and Division Street: America; Talking to Myself and in 2001 – Will the Circle Be Unbroken: Reflections on Death, Rebirth and Hunger for a Faith and many other books, he loves to tell the story of the librarian who wanted to ban his book Working, because she read the spine wrong and saw Working Studs! He would cackle, certain that small-mindedness is wrong and certain that once again he was right. He holds his convictions firmly. I always heard he’d been blacklisted during the McCarthy era. Loving politics and justice and art and human foibles, Studs lived more than most and he remembered what he’d seen and he loved to talk about it. He was known as a great listener but I’ve always thought he was a better talker. He appreciated the past, lived in the present, and looked forward. Seeing Studs in his apartment on the north side of Chicago – where he lived with his wife Ida, (who passed away in 1999,) was odd when he was older because he had more youth and exuberance than most young people, he loved to talk about the future, and there you were in a lovely apartment that looked like a 1960’s place – with the Scandinavian furniture and shelves full of vinyl records and Marimekko type design. Of course it was filled with loads of new books. I hope his home will be documented, it will tell future generations much about the love of books and the life of a twentieth century lefty intellectual. His is a life well-lived. I remember seeing Studs at the theater, in bars watching baseball games and rooting enthusiastically, almost exactly three years ago I watched him and Garrison Keillor recite some of their favorite poems to each other, in a radio studio. Their mutual respect was clear. They played off of each other and yet, each a ham, each wanted to outdo the other. Two grown men, dueling, and at the same time expressing affection, with poems. In 1999 I saw Studs at a poetry reading, I wished him well and he fiercely proclaimed that he wanted to make it to see the 21st century. He said it the way Muhammed Ali used to say he wanted to win a fight. Studs did enter the new millennium, but by 2005 his ticker was giving out. So, at age 93, he went for open-heart surgery. He pulled through very well and amazed his friends and doctors. Now, I know he wants to see Barack Obama become President. And maybe he will. Studs closed his radio show, and signed books with “Take it easy, but take it.” It’s a quote from another of his political and artisitic heroes- Woody Guthrie. Take it easy Studs. You took it. Move On Up A Little Higher! Send Studs Terkel your best wishes. I’m sure that even though in recent years he is as he says, “deaf as a post” – Studs still hears humanity. The website for Studs Terkel. A video of a conversation between Studs and Andrew Patner. Roger Ebert on How Studs helps me lead my life. You are currently browsing the archives for the WFMT category.